Notice the difference? 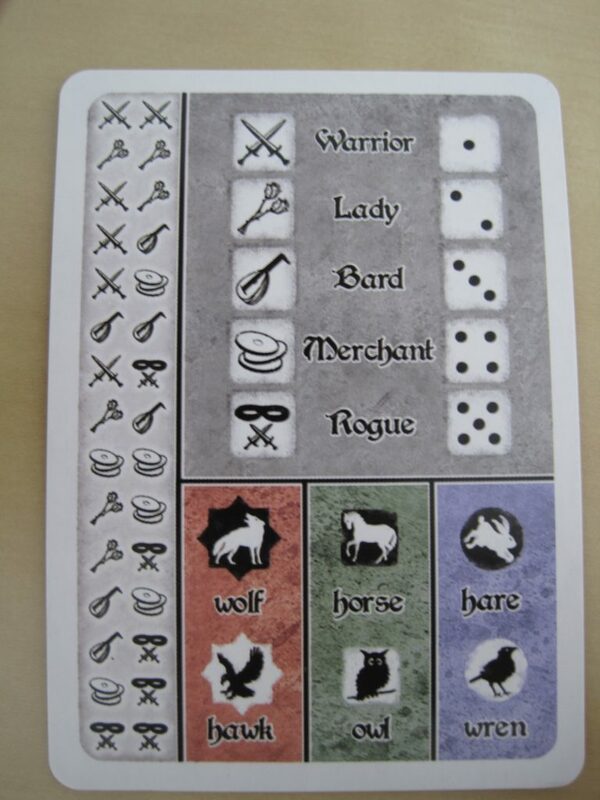 The new card layout addresses a bunch of feedback we’ve recieved from our fans. We’ve dropped the Rogues and Warriors scale to clean up the layout a bit, and mirrored the symbols so you can fan the cards any way you like! Also, to make the cards easier to read for color-blind players, we’ve dropped the square and dot system of identifying the colors in favor of a unique symbols. Blue cards are circles, green cards are squares, and red cards are starbursts. Expect to see Gambling? I’m in! back in stock by December! There are currently three cards that can do this: Kaylin’s “I need some Private Pixie Time”, Wizgille’s gear card “Uh oh! I’d better fix that right now,” and Erin’s Tree form. Players may not play any more cards this turn. 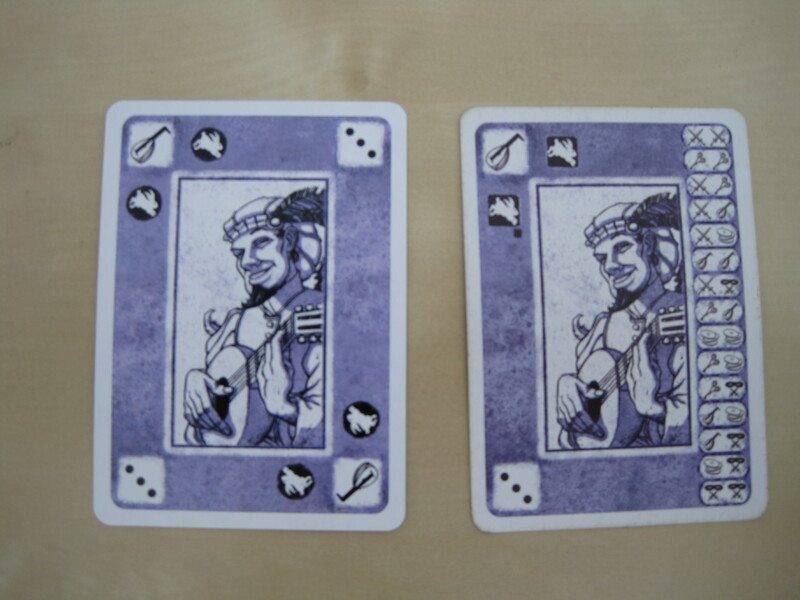 Any cards that have been played but have not yet resolved are discarded and do not take effect. If a Round of Gambling is underway, the anted Gold goes to the Inn. That second bullet is worth discussing further. It basically means that ending your turn at an opportune time can cancel one or more other cards. Here’s an example: Erin reveals Wine as her drink for the turn. Gerki spikes it with “Slip a mickey”, then in response, just to twist the dagger a bit, Fiona plays “Tip the Wench” on Erin. Erin plays “Wildshape” and turns into a tree. This ends her turn, which makes all the other cards go away! Pretty handy, right? Here’s an important thing to remember, though: any card, even one that would end the turn, can be responded to before it resolves! This can cause the turn to continue, since the effect that would end the turn never happens. Example 1: Kaylin plays “I need some Private Pixie Time” to attempt to end her turn. In response, Wizgille plays “I didn’t activate my temporal dilation field. It’s just deja vu,” and reveals “Wow! That actually did what I expected it to.” as her gear (so it resolves normally). Since Wizgille’s card Negates Kaylin’s card, Kaylin’s turn does not end. Example 2: Wizgille reveals Elven Wine with a chaser of Dragon’s Breath Ale as her drink for the turn. Since this would knock her out, she plays “This device can turn alcohol into gold! Watch!” to attempt to Ignore the drink and gain 3 gold. For her gear, she reveals “Uh oh! I’d better fix that right now.” She’s still pretty happy with this outcome, since her drink will just go away. 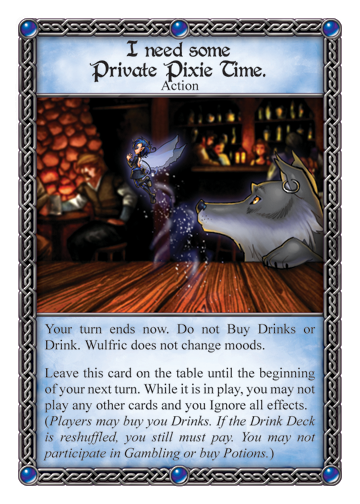 However, in response to her geared-up “alcohol into gold,” Dimli plays “I don’t think so!” Since a device card and its associated gear card count as one big card effect, Dimli’s “I don’t think so!” Negates the entire thing–including the part that would end Wizgille’s turn! Wizgille will have to take her drink normally and will pass out if she doesn’t have some other way to deal with it. So, that’s how this recent new mechanic works. I hope this post was helpful for you all. Remember, ending your turn can be a very powerful and useful effect if you can time it properly, but a card that ends your turn can potentially be Negated just like any other. The Red Dragon Inn 1 and The Red Dragon Inn 3 shipment has just cleared US customs and is on it’s way to our warehouse this week!As many of you know from our previous blogpost, the original restock of RDI1 and RDI3 was delayed do to skullduggery preventing us from having them available for sale at Gen Con this year. We are very thankful to our SlugFans for supporting us through pre-orders and are happy to say we will be able to fulfill those orders over the next 2-4 weeks. On top of that, we are currently fulfilling pre-orders for both Erin the Ever-Changing and Pooky, who arrived in our warehouse last week. Thank you for your support and stay tuned. Sam from SFG has been working on quite the report about our experience with Kickstarter and how the Guide to Inns and Taverns is turning out after two weeks of development after funding. 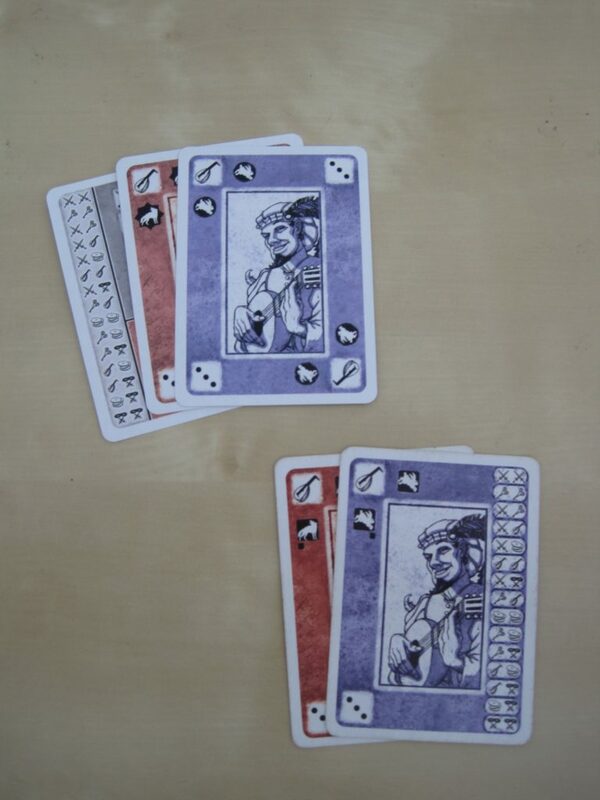 Experienced RDI Player: I drink… (flips over a card)… Wine. New Player: I spike it with firewater! 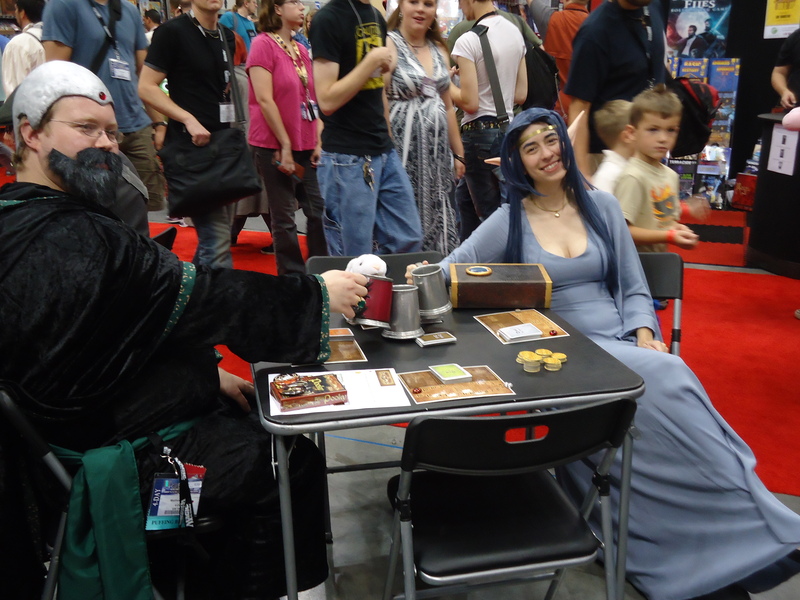 Experienced Player: The Wench thinks you should stop playing with the drinks. 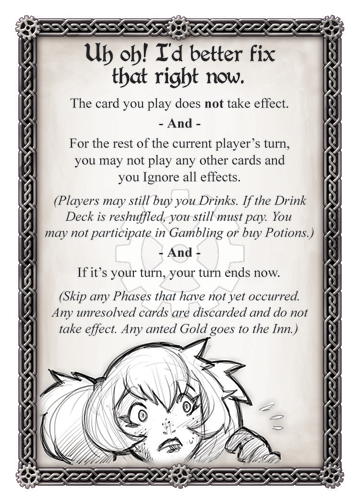 New Player: The Wench thinks YOU should stop playing with the drinks! 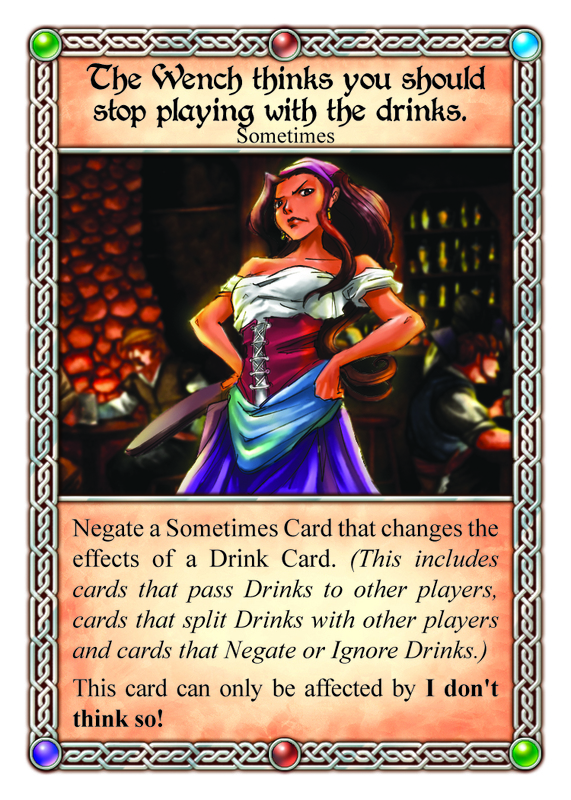 Unfortunately, the funny nature of “Wench thinks…” sometimes leads players to believe that it can negate any card that has anything to do with drinks. That’s not the case, for two reasons. Let’s look at the card! An important general RDI rule to remember is that a card only affects (or changes the effects) of another card if it directly impacts that card when it resolves. So, let’s look at the hypothetical interaction where “Wench thinks…” is played on another “Wench thinks…“. So far, so good. “Wench thinks…” is, in fact, a Sometimes Card. Hopefully that clears up this common misconception. Until next time, SlugFest Rules! We have a whole week to go and that makes our stretch goals absolutely within reach. Help us finish this Kickstarter with a bang! To those of you have been helping spread the word, THANK YOU! To the rest of you (you know who you are…) now’s the time to step up to the plate. Anything you can do to help bring more eyes to the project will go a long way! Seriously though, every little bit we get at this point will be going directly into making a better quality book. 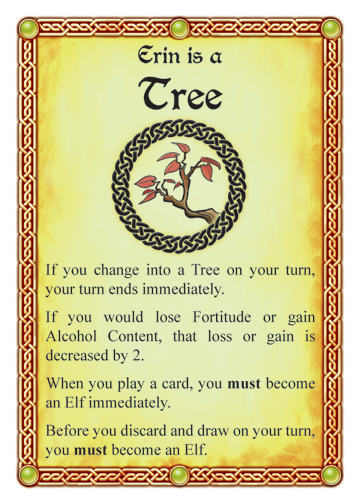 Oh, and don’t forget the Stretch Goals – Drinking Condition Cards, and Tavern Tiles, and Adventures, oh my! Cliff finished the first Wooden Gambling? I’m In! box (available at the Games of Chance Pledge Level). 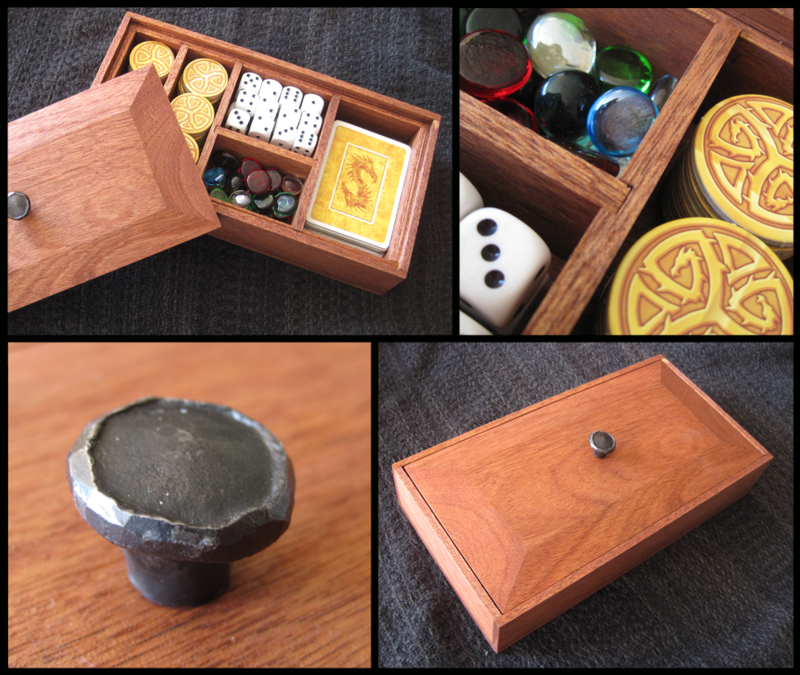 The box is solid hardwood (mahogany) with a hand forged steel knob, and gives you plenty of room for your brand new Gambling? I’m In! set. All of the pictured bits are included. Some one has already snached one of these up and there are only 4 left, so get them while they are available! One of our most awesome backers, Roy Corey, has felt the same way about inns and taverns that we do for some time. He’s even written a song on the topic that we thought you all might enjoy! For the last few years at Gen Con, we’ve run a unique tournament: The Red Dragon Inn Doppelganger Tournament! In this tournament, players are first randomly assigned to 2-4 player games in which each player plays the same character (i.e. 2-4 Zots, 2-4 Fionas, etc.). 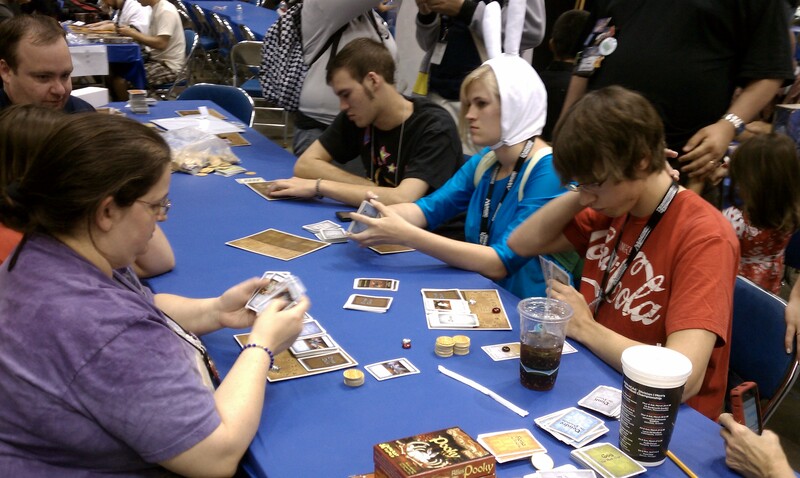 The last standing Gog or Serena at their table is declared the “real” character, and proceed to the semifinal matches. The final table consisted of Deirdre, Kaylin, Wizgille, Pooky, Serena, and Gog. And in case there’s anyone out there who still thinks that there’s no skill involved in RDI, check this out. Final table player Matthew Forsyth (playing Serena) was last year’s champion! This guy knows how to play! Dusty Easley (Kaylin) and Charlie Schaefer (Pooky) play heads-up for the title. A big thank-you to everyone who participated, and congratulations to our champion, Charlie Schaefer!